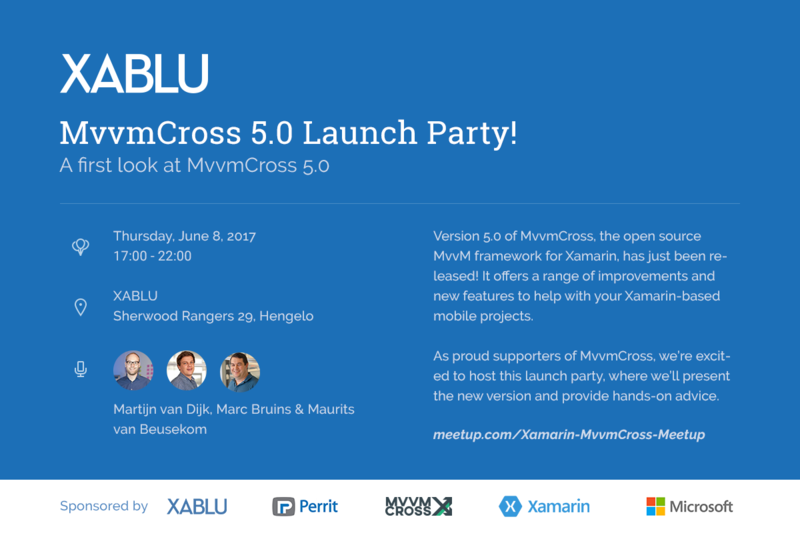 We’re having a party to celebrate the launch of MvvmCross 5.0! Version 5.0 of MvvmCross, the open source MVVM framework for Xamarin, has just been released! It offers a range of improvements and new features to help with your Xamarin-based mobile projects. As proud supporters of MvvmCross, we’re excited to host this launch party, where we’ll present the new version and provide hands-on advice during a mini-hackathon. Whether you’re a rookie or MVP, if you’re a mobile developer and want to learn more about Xamarin and MvvmCross, this event is for you! The excellent catered food and drink are provided by our sponsor XABLU, while Perrit is our location sponsor.